Although the skies were clear last night, the "seeing" wasn't great--"seeing" refers to the amount of atmospheric interference from temperature changes, convection currents, and other funny stuff going on in the air above your telescope. I did get to test out the Pentax 200mm f/4 lens with the Atik 414EX monochrome CCD, and an Ha longpass filter. These clusters are fairly small, so this isn't a very good setup for shooting them, but here you go anyway. 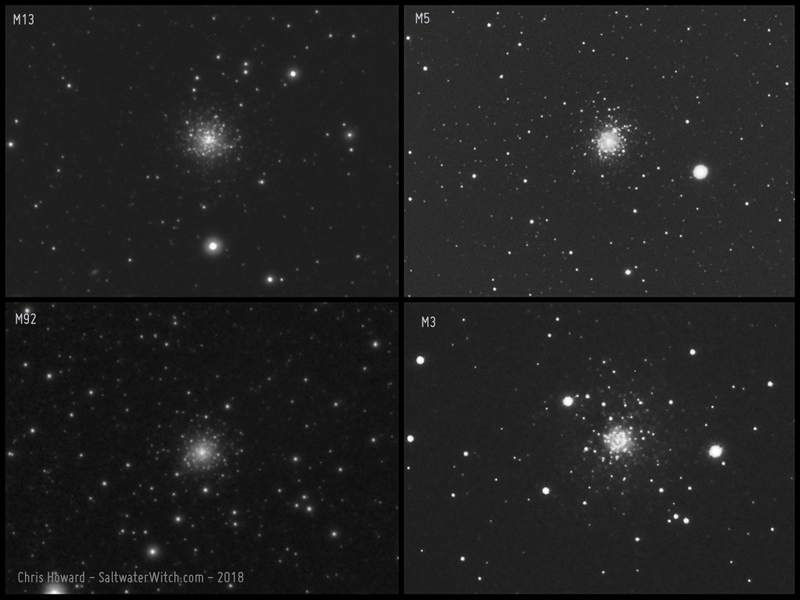 Top left: the 300,000 stars that make up Messier 13 (NGC 6205), a globular cluster in the constellation Hercules. Messier 5 in the constellation Serpens. The M3 globular cluster the constellation Canes Venatici. Messier 92 (NGC 6341) is another cluster in the constellation Hercules.